Google yesterday announced Android Device Manager, a new website and accompanying app coming later this month that helps you find your lost phone or tablet. The service will be available for devices running Android 2.2 (Froyo) and above. 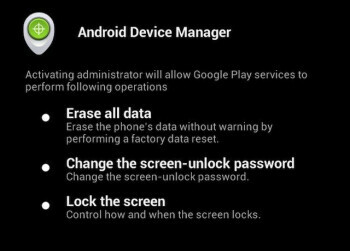 Details are scarce right now, but Google does say Android Device Manager will let you ring your phone at maximum volume so you can find it, even if it has been silenced. We also know you will need to be signed into your Google Account to use the service. As a last resort, the app will also let you ensure your data does not end up in the wrong hands. If your phone or tablet can’t be recovered, or has been stolen, you can securely erase all of the data on your device.